Megacolon is a complication found with a bowel disease, an infection of the colon, or is present from birth. It is a life threateningenlargement of the colon. The enlarged colon does not have the nerve cells that help theintestinal muscles to move the stool. The stool becomes trapped in the colon, filling it, and causing it to expand to larger than normal. Symptoms are abdominal tenderness, abdominal pain, or a swollen abdomen. Dehydration, fever, a rapid heart rate, or constipation may be present. In older children the symptoms can include passing small watery stools, diarrhea, and lack of appetite. A special high fiber diet, stool bulking or laxative medications may be necessary to assist with keeping the bowels moving. In acute cases, intravenous lines for fluid are usually administered to prevent dehydration and shock. Antibiotics may be given to prevent infection. Surgery may be required in severe cases. 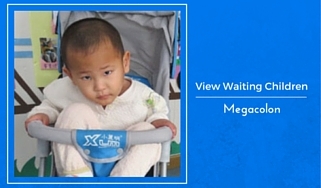 Children with megacolon can usually go on to lead active and normal lives.